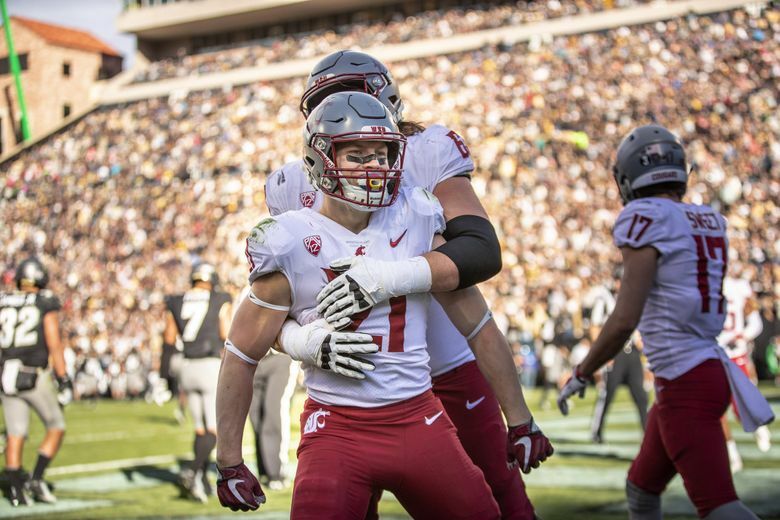 The Cougars earned their highest ranking of the season, setting up an Apple Cup matchup between No. 7 and No. 16 that will determine the champion of the Pac-12 North. PULLMAN – Friday’s Apple Cup will be a clash of the country’s seventh- and 16th-ranked college football teams. A day after dispatching Arizona 69-28 at Martin Stadium, Washington State (10-1, 7-1) moved up one spot to No. 7 in the newest edition of the Associated Press Top 25 rankings. It’s the highest AP ranking of the season for the Cougars. Washington (8-3, 7-2) routed Oregon State 42-23 in Seattle Saturday and moved up one spot to No. 16 in the rankings. The Cougars and Huskies, who respectively are No. 8 and No. 18 in the Football Playoff rankings, will meet in the 111th Apple Cup on Friday in Pullman. Kickoff is slated for 5:30 p.m. and the game will be televised on FOX. It’ll be the third consecutive season the winner of the annual rivalry game decides which team will represent the Pac-12 North against Utah at the conference championship game on Nov. 30 at Levi’s Stadium in Santa Clara. Utah was the only other Pac-12 team to appear in Sunday’s edition of the Top 25 rankings. The Utes clinched the South division title on Saturday by beating Colorado 30-7 and by virtue of Oregon’s win over Arizona State. They jumped three places from No. 21 to No. 18. In the Amway Coaches’ Poll, the Cougars moved up two places to No. 7 – their highest ranking of the year. The Huskies jumped one place to No. 16 and the Utes moved up two spots to No. 17. The top six of the AP Top 25 went unchanged on Sunday. Alabama still sits at No. 1, followed by Clemson, Notre Dame, Michigan, Georgia and Oklahoma. Right behind WSU at No. 7 are No. 8 UCF, No. 9 LSU and No. 10 Ohio State.